This listing includes 1 - 6" Rustic Charm Planter, 1 - Germination bag and 1 - Quart of Fiber Soil with hydrating bag. a) Makes your plants look great. b) Adds style to your home. d) Includes a unique soil that makes your plant flourish. e) Includes germination bags for easy seed starting. f) Includes clear, illustrated instructions to ensure success. Grow Some Seeds, It's Fun! 1) Letting the seed dry out during germination. 2) Not germinating the seed in a warm enough environment. We've taken steps to help you succeed. 1) We've included a germination bag that will keep seed warm and moist. 2) We've provided a unique fiber soil that has an incredible ability to prevent overwatering. Most potting soils get overly wet depleting its oxygen reserve, which eventfully causes plant failure. Our Fiber Soil holds its structure, supplying ample oxygen to plant roots, allowing plants to grow and flourish. Note: Fiber Soil has minimal nutrients. It's recommended to add fertilizer for your plants, for seedlings add fertilizer after seeds have germinated and grown up to about ½" tall. ***CHECK OUT OUR STORE! 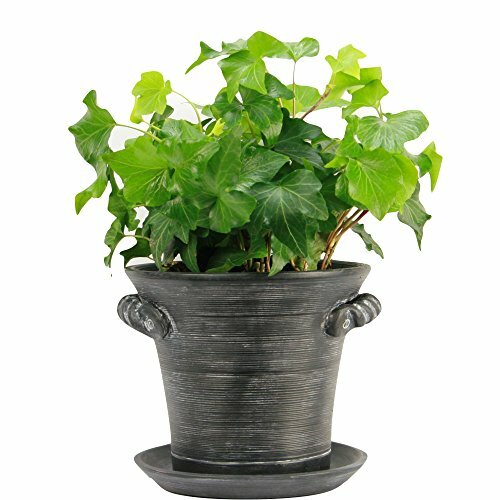 - Click on the blue Window Garden link at top of page*** GORGEOUS - Designed with a distinctive rustic style, this attractive flowerpot will add an old world charm feel to any house. Plant an orchid, cactus or an African Violet, any plant will look stunning in this planter. INCLUDES SOIL - Plants thrive and live longer with our unique Fiber Soil. The natural fibers provide abundant oxygen which reduces root rot from over watering, the number one reason for plant failure using traditional potting soil. SEED STARTING - We've even included germination bags to start seeds. Place the bag over the planter to retain moisture and keep seeds warm. Start a kitchen garden from seed and have fresh herbs to cook with whenever you need them. 5 COLOR CHOICES - Choose a color that complement's your home, Terra Cotta, Charcoal, Verde, Ivory and Slate.